Caregiver jobs are growing at a rate of 26% per year. That's much faster than average. That means the format for your caregiver resume doesn't matter. You can jot it on an empty bag of M&M's and get a job. All caregiver jobs aren't created equal. The good ones pay better. They have benefits. Management treats employees with respect. To get those jobs, you need a professional care giver resume Mary Poppins would admire. A caregiver resume example better than 9 out of 10 other resumes. How to write a caregiver resume that will land you more interviews. Tips and examples of how to put skills and achievements on a caregiver resume. How to describe your experience on a resume for a caregiver to get any job you want. Here's a sample resume for a caregiver made using our resume builder. Caregiver Resume Example - See +20 resume templates and create your resume here. What's the Best Format for a Caregiver Resume? 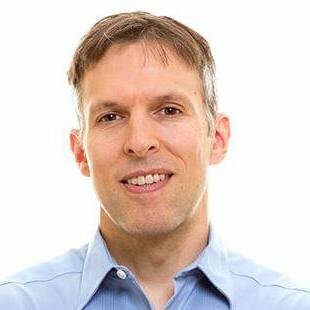 Does format really matter for a caregiver resume? Caregivers need to demonstrate attention to detail. If your caregiver resume is sloppy, the hiring manager will hit delete faster than you can dust a coffee table. Start with the reverse-chronological format. It puts your best achievements first. Use clear, legible fonts and headings. Make good use of white space so as not to overwhelm the reader. Last, save your caregiver resume as a PDF. Those translate well between computers. Do the above, and you'll put hospital corners on your caregiver resume. Pro Tip: Check the job listing to make sure PDFs are OK. Some Applicant Tracking Systems stumble on caregiver resumes saved as PDFs. 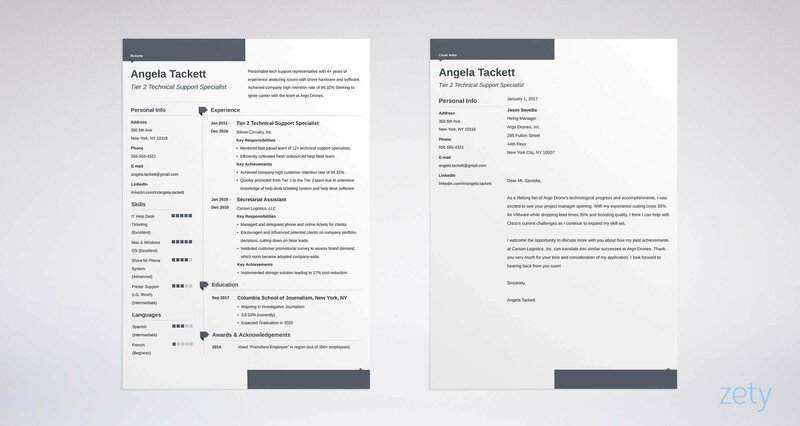 Need a reverse chronological resume template? Want to see some other formats for your caregiver resume? Check out our guide: "3 Resume Formats: How to Choose the Best One [Examples]"
Imagine you've got a patient. He's a sweet old man, but he'll only take his pills with orange juice. And he'll only drink one cup of that per day. It's the same way with your caregiver resume. That's because the average HR manager spends just six seconds looking at each resume. You need to use that time to prove you're worth a closer look. Do it with a caregiver resume objective or a resume summary that stands out like a Nobel Peace Prize at a yard sale. Use a resume summary if you've got mountains of experience. See if you can spot the problem with the first of our two samples from caregiver resumes. Experienced caregiver, working since 2010, both in nursing homes and for private clients. My patients love me. I'm very compassionate and a good cook. That's 70% fine, which leaves it 30% terrible. Why? It lacks details. Compassionate caregiver and CNA with 6+ years experience providing in-home patient care. Have consistently maintained client reviews in excess of 94% positive. Driving record - 100% clean. Receive regular commendations for efficiency and for cooking delicious, nutritious meals. Wow, right? The recruiter just stopped wondering if she forgot to feed the Pomeranian. Don't have those qualifications? I'll show you how to make a caregiver resume summary just like it in a bit. Here's the tricky part. What if you don't have experience? What if your care giver resume is as blank as freshly laundered sheets? In that case, kick it off with an objective statement. Those work for entry level caregivers or anybody seeking a new niche. I'm a caregiver. I don't have any real-world experience yet but I'm very compassionate and I have a strong work ethic. That's pretty good, isn't it? Unfortunately, "pretty good" on a PCA resume works as well as "pretty good" CPR. Your entry level caregiver resume needs measurable wins. Compassionate caregiver with two in-home disabled clients. Proven track record of excellence in providing for daily needs, including homemaking, cooking, transportation, and supplementing therapy. Have received frequent commendations from clients and families for compassion, efficiency, and time management. Praised for patience and problem solving. If that's your objective statement, you'd better have your W-9 in order, because you're getting hired. But wait. How did a brand new caregiver get that kind of experience for her resume? She did it by doing a little volunteering and by taking on some short-term work. Pro Tip: Your caregiver resume's summary or objective are the frosting on your job search cake. Write them after you write the rest of your resume. How important is experience in a caregiver resume? Only as important as reliable transportation to your client's house. Without it, you're not going anywhere. Now let me show you how to make a caregiver experience list that'll wake up the hiring manager like an epi pen. The key point? Match the job description to the resume. First, make a list of all the jobs you've had. Jot down every achievement, win, and kudo you can think of. Save your list of wins. You'll use it to custom fit future caregiver resume templates to each job. Then, for this job opening, show your most recent work experience first. From your master list, pick "wins" that match the current caregiver job description. Provided non-medical home care service to elderly/disabled patients. Focused on personal care, companionship, homemaking, and transportation. Achieved the high end of the pay scale based on client reviews of 96% "excellent." Awarded 100% ratings for punctuality, efficiency, and compassion. Received five personal letters from clients and their families thanking me for the quality of my meals, referencing both enjoyability and nutrition. Maintained 100% clean driving record while transporting clients to appointments, shopping, and accompanying them to museums and cinema. Pop. (That was the champagne cork when you got the job.) Look at all those details. It shows several marketable skills. It's got numbers. Proof. It's miles better than the next elderly caregiver resume sample. Provided in-home care to patients. Responsible for transportation and homemaking. Drove clients to movies and other entertainment. Took care of food shopping for patients. Where are the details? It's like taking a patient to the ice cream store but not actually buying her an ice cream! But what if you don't have any experience to start with? It's true you need experience for a caregiver resume. But you don't need years of it. In fact, you can get enough experience for a PCA resume in just a few days. Volunteer. Take on short-term work. Help out with relatives or friends. Or offer to assist at a local nursing home or other health care facility. Caregiver experience: I don't have any real-world experience yet but I'm very enthusiastic and a hard worker. That is blander than low calorie toast served with distilled water. But look what happens when we add details, as in the next of our child caregiver resume samples. Provided in-home care for two disabled children. Focused on daily needs, homemaking, cooking, transportation, and supplementing therapy. Received frequent commendations from clients and families for compassion, efficiency, and time management. Praised for patience and problem solving. Noticed one patient's nutrition was poor. Notified family members. Patient was found to have a thiamine deficiency, which was corrected. Provided regular transportation for shopping trips and outings. I don't know about you, but I want that person to take care of my child, my mother, my father, and even me when I get older. But really, anyone can write a resume for a child caregiver like that with just a little effort. Pro Tip: To give your PCA resume that glow of health, note the requirements listed highest on the job description. Feature them first in your experience section too. Need some action words to reinvigorate your professional caregiver resume? See our guide: "+80 Examples of Resume Action Words for Every Profession"
The good news: Caregivers don't need a formal education. The bad news: Some have it anyway, and they use it to get attention. Don't let them put your caregiver resume on managed care. Below, I'll show you how to use your education to prove you're perfect for the job. Then fill it in with details that fit the job description like a pair of custom Finding Nemo scrubs. That resume example is almost literally on life support. So you graduated from high school, but your education section could do so much more. In the next of our caregiver resume samples, we'll see what happens when we add details. Excelled at CPR, AED, and communication training. Received high marks in clinical evaluation. Pursued a passion for biology coursework. Active member, 4H Club. Facilitated 15 fundraisers. Administered four fundraisers for Breast Cancer Awareness. See that? Full remission. That education section enhances any personal care aide resume. It highlights the CNA certification. It shows you were preparing for caregiver work even back in high school. The 4H club entry shows interpersonal skills. Both fundraising achievements prove compassion. And what is a caregiver job but compassion at every turn? Finally, it takes a lot of organizational skill to administer a fundraiser. That's one more feather in your caregiver cap. The magic is that anyone can do this. Just dig into your past to find achievements. Pro Tip: Did your CNA training take four weeks or eight? Eight is better. If you did the time, take credit in your caregivers resume. Want your caregiver resume to get attention like a blaring bed alarm? See our guide: "How to Put Your Education on a Resume [Tips & Examples]"
Oh oh. You just got passed over for that great caregiver job. The worst part? It went to someone with less qualifications. Why? The hiring manager was tired and didn't see your certification. Don't fall victim to a bleary HR manager. If you're a CNA, display your certification in several places. Put it high up on your caregiver resume. Add it near your name, and in your resume summary. That's like showing up at a patient's house with movie tickets. Instant attention-getter. For extra credit, put your CNA program in your education section. Finally, add "CNA" to the caregiver job descriptions in your resume's experience section. Need an example? See the sample caregiver resume at the top of this guide. Pro Tip: The Red Cross offers respected training for CNAs. They provide hands-on classroom time and valuable instructor feedback. Looks great on a home health care resume. Need more tips to help add certifications to your caregiver resume? See our guide: "How to List Certifications on a Resume: Guide +20 Examples"
What does a caregiver get paid? That depends on her employer. So let's peek in on one. His name's Bill. He wants a caregiver for his dad, who isn't feeling well. He's also got a big crick in his neck from looking at 200+ caregiver resumes. Sadly, they all show skills lists as identical as hospital johnnies. Then he gets to yours. He sits up straight. You read the job description. Highlighted the skills in it. Then used them in your caregiver resume. Finally, you sprinkled them throughout the experience and education sections of your HHA resume. Let's say this job description specifies compassion and a strong work ethic. It also values patience, and an ability to follow directions. So, you put those in your caregiver resume's skills list. Then you add time management, Alzheimer's care, and a positive outlook. That's so you're not pandering. Delivered daily living assistance to 50+ residents in high-end senior living facility. Received caregiver of the month award 2x for strong work ethic. Managed 20% more patients than average based on good time management skills. Received letter of commendation for consistently following directions. Maintained 94% positive client reviews for patience and a positive outlook. Promoted to Alzheimer's care lead for displaying patience and compassion. You win. Suddenly you're Mrs. Doubtfire with a driver's license.. Need inspiration for your caregiver resume skills list? Start with the sample skills below. If you follow the advice above, your caregiver resume will come across like it was written by the Dalai Lama in scrubs. Pro Tip: Don't just use your skills in your experience section. Show them in every section of your caregiving resume. That includes education, interests, even hobbies. Want your skills section to work miracles? Use the sample caregiver resume at the top of this guide. Also, see this article: "+30 Best Examples of What Skills to Put on a Resume (Proven Tips)"
You need to convince a jaded resume reader that you're different. To do it, prove you can handle the duties of a caregiver. With hobbies, interests, and other sections. Tip: don't cite things like, "long walks on the beach." Use the right details, to make your caregiver resume jump off the page like Deepak Chopra wrote it. Volunteer twice a month at the Downey St. Soup Kitchen, making chowder. Make dinner every Thursday night for elderly neighbor, a shut-in. Volunteer work shows compassion. "Compassion" is almost literally what caregiver means. This volunteer work shows another caregiver skill: cooking. The best part? Even a couple days of volunteer work looks great on a professional caregiver resume. If you need resume candy even faster, search your past for "other" achievements you already have. Those can be courses, conferences, publications, and references. They look great on a resume for a caregiver. So do interests and association memberships. Pro Tip: Is your personal caretaker resume as empty as a fridge on shopping day? Add more "other" sections. Make sure to tie them to the job description. For more tips to enhance your caregiver resume other sections, see this guide: "+20 Best Examples of Hobbies & Interests To Put on a Resume (5 Tips)"
"Employers won't read your cover letter." 60% of hiring managers won't. The rest consider them essential. Why? Because most resumes display the same old boring stuff. I'm about to show you how to do it right. Make it personal. Start with the manager's name. Show your passion. Pick a detail or two you like about the job description. Display your value. Do it with a couple high points from your caregiver resume. End it with a call to action. "I'd love to discuss your needs" will do. Pro Tip: A few days after you send in your caregiver cover letter and resume, follow up. A well-timed thank you note can remind the employer who you are in just the nick of time. Need a sample to help write your caregiver cover letter? See this guide: "How To Write A Cover Letter [Complete Guide With Examples]"
It's easy to add contact info to your caregiver resume. Right? Don't use that fun email address from back in college. You know, the one with all the animal names and silly adjectives. Add your LinkedIn profile if you have one. You can also include Twitter, Facebook, Instagram, and other social handles. Why? Adding social media to your home health aide resume can give your next employer a sense of you as a person. Pro Tip: Sanitize your social media profiles for best results. That photo from your Cancun trip five years ago can send your caregiver resume into cardiac arrest. See our great guide on fixing social media nonos here. Want more advice for how to write a professional caregiver resume? See this guide: "How to Make a Resume: A Step-by-Step Guide (+30 Examples)"
Make a master list of caregiver skills. Use it to customize your own caregiver resume templates for each new position you apply to. Tie your skills to the caregiver duties in your resume experience section. Use measurable achievements, backed by numbers. Write a resume summary or a resume objective. Since it's the Reader's Digest version of your caregiver resume, write it last. Finally, see the sample resume for caregivers at the top of this guide for inspiration. Got questions or tips about how to write a professional caregiver resume? Give us a shout in the comments section! A complete guide to writing a resume for a certified nursing assistant. +20 real examples will show you how to describe your experience and write a CNA resume. 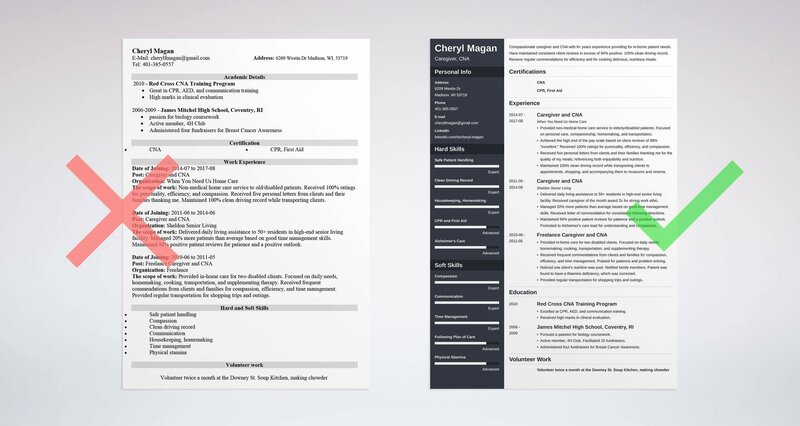 Use our CNA resume sample and a template. Read more!